Herr Ingo Roggatz set up as an importer (US - 'jobber') and/or registered the ZZ logo of two superimposed Z's in the - then - West Germany on the 19th of May, 1973, the trademark was awarded on the 4th March 1975. The company may be extant, but the registration of the trademark has lapsed or been surrendered - "Registration Cancelled"? Mr Roggatz (or his successor) now seems to be trading as Nordblume GmbH a floristry and giftware wholesaler. He originally imported toys, gifts and general home-ware, a good deal of which came from the - then - British Crown Colony of Hong Kong, latterly just 'China'. Generics were overprinted or ink-stamped with the ZZ logo, and two lines carried the Riesen prefix; Riesen Farm and Riesen Zoo, as a range. 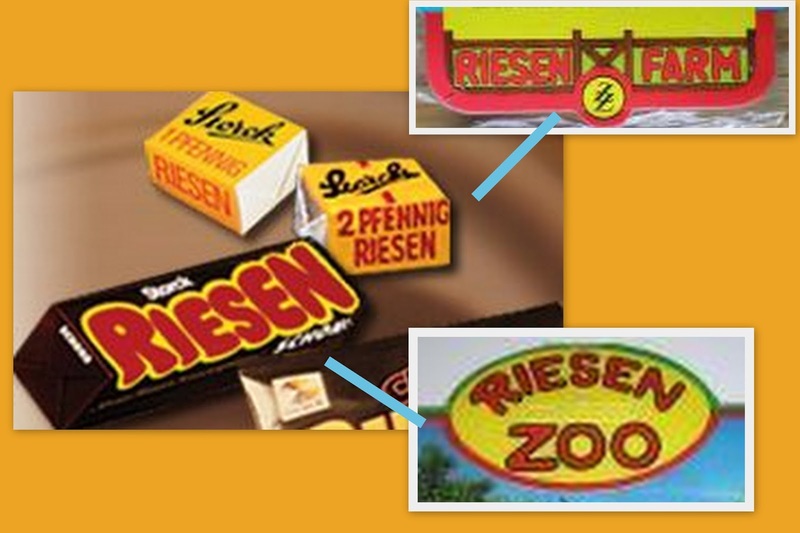 The 60mm Wild West were mould-marked ZZ in raised letters, as was some of the Riesen animal range. A debate about the graphics of the header-cards on these bags is ongoing; there were three styles (two farm - numbered and unnumbered; and one zoo), they all bearing a more than passing resemblance to the earlier packaging of Storck Riesen Schocolade, small chocolate-covered toffees. · Time (1970's) and . . .
is beyond coincidence, the only question is whether there was a link between ZZ and Storck or just some clever scamming by ZZ. Increasingly it looks as if ZZ were deliberately trying to link their product to the chocolate candies, although a publicity or 'premium' link can't yet be ruled-out, particularly when you consider that Storck were also shipping their toffees to Hong Kong, where the toy products were coming from. The US issues were handled by R. Dakin (who claimed to have "Exclusive distribution in USA…") and Skyline Inc. They both also claimed the products were made (and 'Hand Painted') in West Germany, when they were in fact HK knock-offs. Dakin may only have handled the Farm, but Skyline handled both. The fact that one claimed exclusive rights is probably explained by the way territories were divided-up in the US market, one taking the West Coast salesmen (Dakin), the other the East Coast (Skyline), it's easy to see how Dakin - to impress customers - would make a claim they knew to be incorrect, as they also knew their bags would never been seen next to Skylines'. It should be noted that the stickers on both sets of imports clearly came from the same (German or HK?) source. Skyline were a jobber in similar vein to ZZ, importing/carrying inflatable beach/play furniture, Halloween trick-or-treat bags, Japanese-made train sets, 'Shrinky-Dinks' and such-like. Dakin were probably similar at the time, also sourcing stuffed toys and teddy bears, however they went on to make a fortune off the back of Garfield the cartoon cat merchandise licenses and became a major manufacturer of soft toys, famously commissioning the Dakin Building, on the San Francisco Bay in Brisbane, California…well, it's 'famously' if you're also a student of architecture or Star Wars! Among ZZ's other toys were tin-plate Christmas tree decorations, some ex-Giant product (Wild West) and copies of British and European 'Cowboys & Indians' (Native Americans) in both 54 and 60mm, these were above the usual HK quality - as were the Riesen range - but if ZZ were dealing with pan-national jobbers like Dakin, Skyline and the Rosenberg's Giant, that's not so surprising.